Brotzeit Lokal is memorable for more than being a mouthful to pronounce. 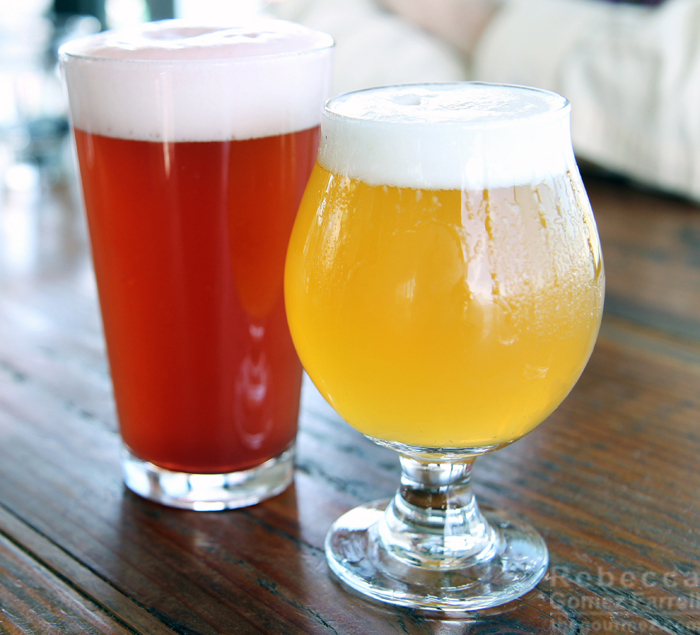 We all love beer gardens, right? So what makes a beer garden even better? A beautiful view! 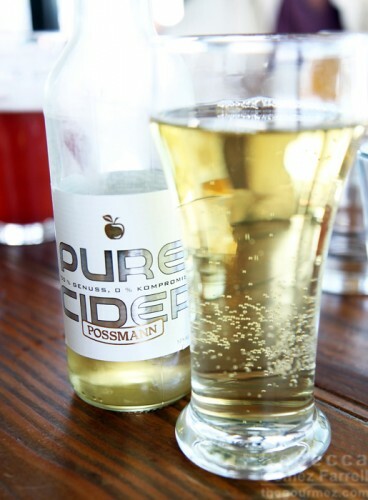 You can see it from inside the tinted glass walls of Brotzeit’s dining room, but the open-air patio is where that beer garden pull is strongest. The patio is lined with picnic benches and comes with a refreshing breeze from the little marina it shares space with. It’s especially scenic in those late afternoon, early evening, happiest of hours on weekdays. I have one friend who’s a big fan of the $1.50 oyster specials at that time. 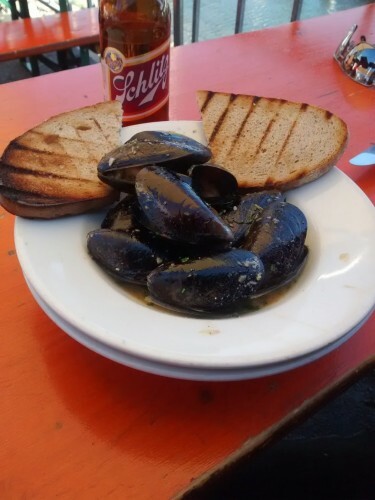 Yes, those are mussels, but just play along and pretend I have the right photograph. Brooklyn Basin isn’t the same as gazing across the Bay to San Francisco, of course, but it’s ideal for feeling more secluded from the crowd. You’re more likely to find housecats dashing between the moored boats than cargo ships crossing under a bridge there. In food and beer selection, Brotzeit Lokal aims squarely at the fatherland of beer gardens: Germany. Belgium also plays a significant role in the list of 16 drafts and 20-odd bottles available. A Dirty Hoe and a Dirty Blonde, drunk by friends on my most recent excursion. 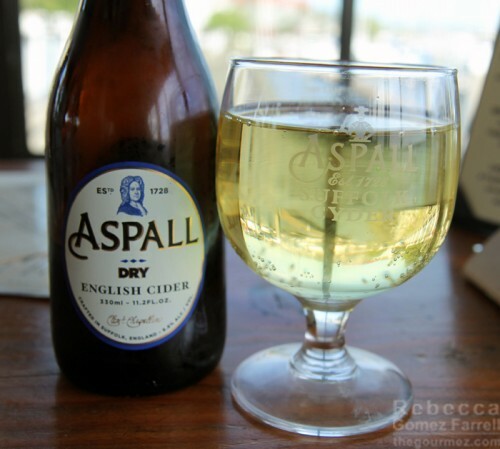 –but Aspall’s Dry Cider, from the UK, hit the spot, providing the crisp, dry, minerality I find refreshing in a good cider. Over the past three years, I’ve made roughly five visits to Brotzeit Lokal, and the waitstaff have varied greatly in demeanor. Some of them are gruff, loathe to offer details, and hard to locate when you need them. Others make regular rounds and complete service with a smile. Dishes, similarly, have ranged from acceptable to excellent. On that most recent visit, I tried the pretzel bread pudding served with whipped cream and a salted caramel sauce. 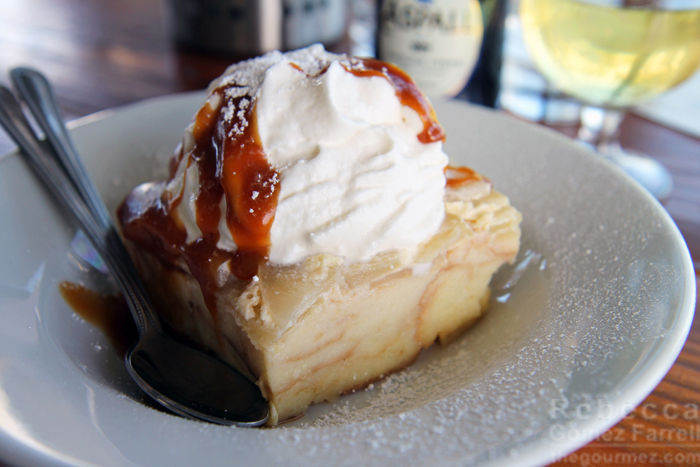 While still bread pudding, which is nearly always tasty in my book, I was disappointed they went custard- rather than homestyle in preparation–if pretzel is in the menu item description, I want it to be somewhat recognizable in the dish. 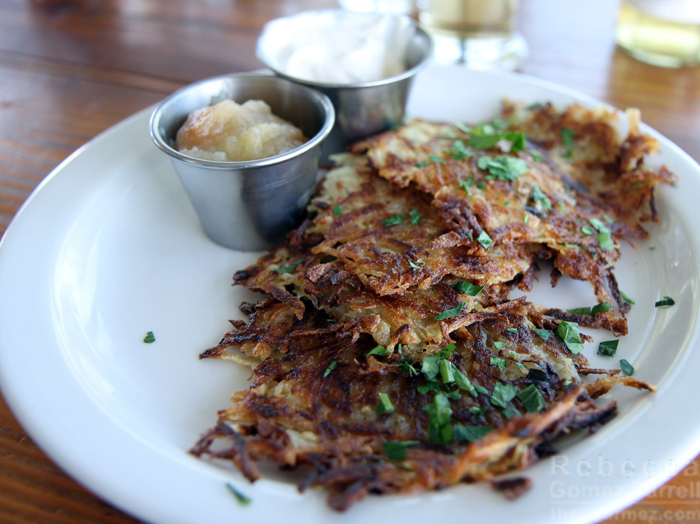 But my potato pancakes, called kartoffelpuffer, may have been the best I’ve had since I worked at a Czech restaurant in Davis in 2002–2003. A little greasy, but they had great crunch, good flavor, and just the right amount of apple sauce and sour cream to complement them. The sausage accoutrements are good, though warmer than I prefer for pickles and slaw. The sausage itself disappeared within that bun, leaving me with little impression other than dryness. To be fair, that is partially my fault for not liking mustard. I know, German sausage without mustard?! The scandal. But I would hope the sausage served would leave an impression without it. Ultimately, I think Brotzeit Lokal is worth going to for the view alone, and the chances of also finding tasty food to go with your brews are good, if not always as memorable. If you go, you should know that it’s actually situated behind the Homewood Suites on Embarcadero. Drive down the hotel’s right side and head toward the water. You’ll see Brotzeit Lokal and its views soon enough. Most recently visited 23 March 2016.